Don't blink --- you might miss a ridiculous swing in oil prices. The latest move was to the upside. Big time. 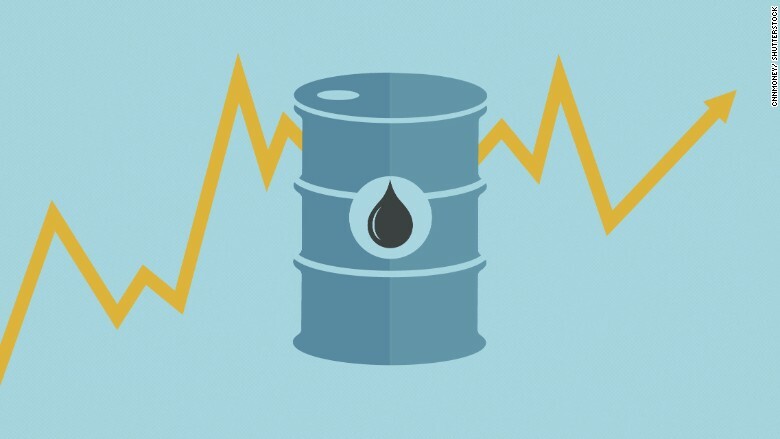 Crude oil prices spiked 12.3% on Friday to $29.44 a barrel. It was the biggest one-day percentage gain since February 2009. The surge comes just a day after oil plummeted to $26.05 a barrel, the lowest level since May 2003. 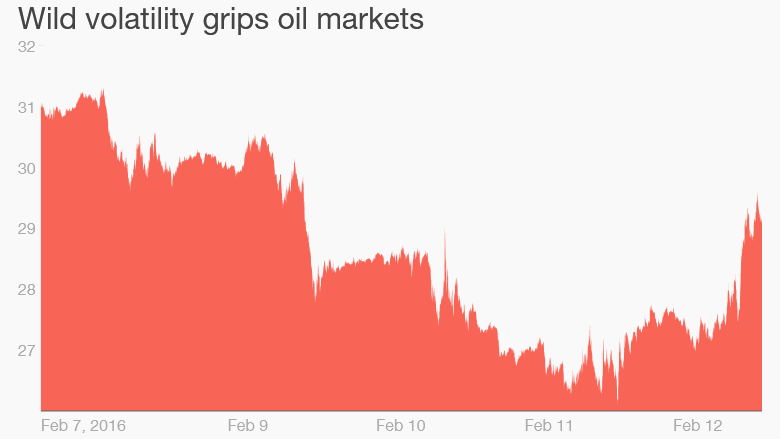 The huge reversal helped lift the U.S. stock market, which for weeks has been spooked by collapsing oil prices. The Dow was up more than 300 points in the final hour of trading on Friday. Experts attributed the oil price spike to deeply oversold conditions and a desire by investors to cash in when prices eventually move higher. "There is this overpowering urge to jump on board any bounce," said Walter Zimmerman, senior vice president at United-ICAP. But Darin Newsom, senior commodities analyst at DTN, warns the backdrop for oil remains challenging due to the epic supply glut that has caused oil to crash by 70% since mid-2014. "We're still looking at a bearish situation," Newsom said. The rally began late on Thursday after Dow Jones reported an official from the United Arab Emirates said OPEC is "ready to cooperate" on output cuts. However, the UAE official also signaled that he believes OPEC's strategy of flooding the world with oil is starting to work. Despite the market reaction, Matthew Smith, director of commodity research at ClipperData, is skeptical that the comments represent a real shift in OPEC strategy. "We have heard from various ministers and countries over the past few months about the potential of a production cut, but nothing has come to fruition," he said. The crash in oil prices has fueled concerns that the global economy is in trouble. That's despite the fact that many believe the oil collapse has been driven by a supply problem, not a demand one. While cheap oil is great for consumers, it has led to a surge in bankruptcies by energy companies and fueled worries about big banks that financed the oil boom and emerging market economies that rely on energy exports. Zimmerman believes the oil market is oversold enough to sustain a multi-week or even multi-month price increase. "There is this overpowering urge to jump on board any bounce. But have the final lows been put in? "It's way too early to say for certain. We're going to have to be patient," Zimmerman said.